"in relatively heavy waves the centerboard gave way, flapped around, slapping the keel then broke off. The line to the board is all that I know for sure is left. I will have to lift the boat out to determine what other, if any, damage was done to the keel." It appeared that the pin broke but a full inspection was pending. Since then a few emails have passed under the keel. With the help of the Dolphin network Ted connected with George Watts (Odile) and the stainless steel centerboard that has been resting in George's basement closet in Cohassett, Massachusettes, for 20 years, has found a new home - in Wilmette, Illinois. 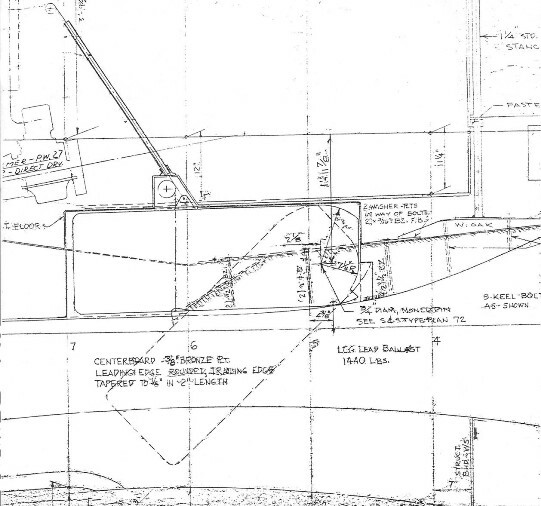 On July 24, 2010, Ted sent in a update on his centerboard project - with pictures to follow. I eventually will get to the write up with pictures of the complete centerboard and rebuild of the cabin floor saga for Wada Boat. We finally got WADA back and in the water on July 2nd, then rigged and had our first sail of the season on 7/3. We have all kinds of wind and shifts... The centerboard works great! Thanks again for your help connecting me up with George Watts and his O'Day, (Odile's) stainless steel board - shown here on the left, photo taken at George's house in Cohasset, Massachusettes. 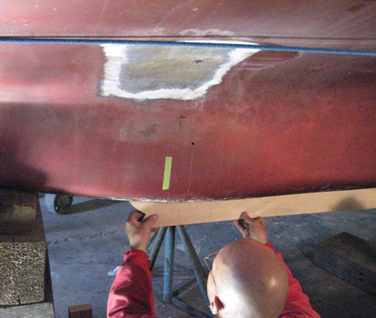 While the board required minor modifications to fit the Yankee centerboard well, the boat itself required a major job to install it according to the S&S specifications for the original Dolphin designs. Yankee had drifted significantly and upon consultation, the variations were not endorsed by the S&S architect for this retrofit. Billy McAffrey, owner and operator, and chief of High Tech Boat Works also did not want to do the work unless we followed the design specifications... and so a long and expensive task was undertaken. This included boring a new pin hole through the lead in the keel. The drilling turned into a time consuming job requiring special bits and tooling to drill out the lead. After much measuring, figuring, jiggering and consternation the final result worked out well. The old board now has a new life in old Yankee 190. The boat handles better, too in my estimation... just as the designer planned for the hull. While the boat was in the shop for months I took full advantage of the situation and completely redid the decks and cockpit with a full 2-part Perfection prime and coat, plus new nonskip. It was a big effort, but it has renewed the Wada wonderfully. Working with Billy was an education. He is a perfectionist and very deliberate about the jobs he and his team undertake. He did take photos of the centerboard work, but I have yet to receive them. I gave him a Flash stick to put them on and await them still. However, I know he is currently focused on his prep for this year's Mac Race. So, I don't aniticipate getting anything from him for a few weeks. I'll get back to writing up the centerboard saga when I get the pix. However, one thing is certain, it sure is not something that I would ever recommend undertaking on your own. We have had a couple of inquiries recently regarding new centerboards. This prompted back and forth emails with Ted, resulting in pictures and the following consolidated update, May 24th, with May 31st, 2012 additional text inserted as appropriate (minor edits). Good to hear from you. I regret the lapse in getting to the 'round to it' response... long lapse with much wind and water swirled past in the whirlwinds of time. I've taken your suggestion and poured a stiff rum and tonic with which I am lubricating myself to get the tale unfurled for us - as I have just completed launching, rigging and tuning for 2012. First and foremost, below is the contact information for the wizard of the boat works, Billy McAffrey. Old Yankee Dolphin 190 was in shure need of a wiz to work with the centerboard challenges confronting me. I contacted Billy today and he is still in the boat wizard business. 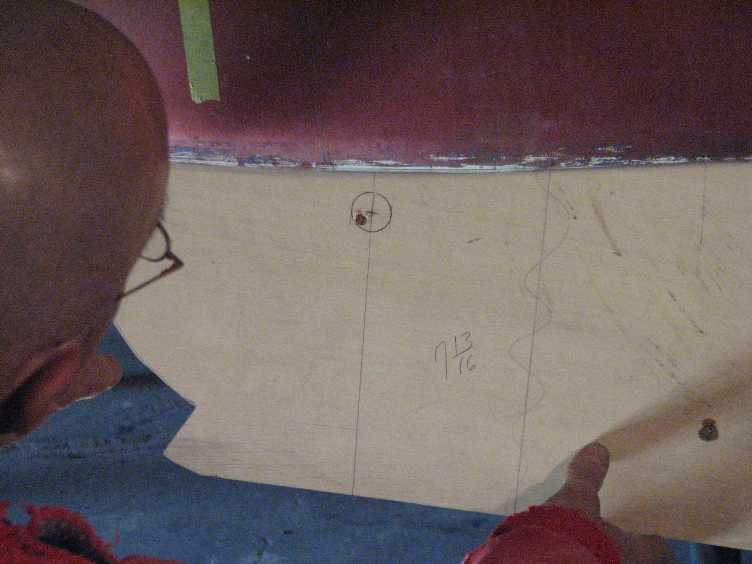 He had made a template of the O'Day centerboard (that you connected me with several years ago) as part of the process of replacement. He is looking to find the template amongst the cavernous confines of Billy World. He is available for the next centerboard challenge and has a merry crew of men and equipment to make things come together. That's the quick part of the story and probably of most immediate interest to the next Dolphin with centerboard distress. Now to the twisted tale of Yankee Dolphin deviations from Sparkman & Stevens designs. I've attached some photos. I have named the files to describe the images. Yes, Yankee, for whatever reasons, and unknown to S&S with whom we consulted, modified the centerboard location, pin size and board composition. All to the dismay of the S&S rep we consulted. The Dolphin 24.org plans for the board and the pin are the correct designs. Whatever Yankee designs may have been created were unable to be found. S&S strongly advised against replacing the board the way it was and where it was. Billy also was strongly opposed to trying to alter the intent of the boat designers. And the salvaged board was the final persuader that it was time to undertake a retrofit to make the Yankee conform. As they say, easier said than done. 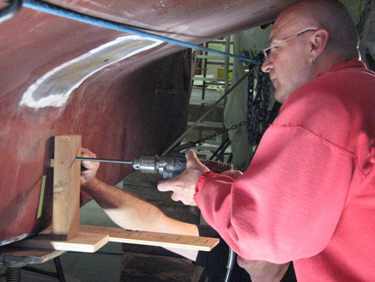 Drilling through the lead keel, where the pin should be placed, and where the centerboard should pivot for proper alignment and support (as opposed to pouring the lead with a hole for the pin in the first place), was a challenge even for the wizard of boatworks and his men. Several improvisations and special tools had to be devised and milled, along with the correct S&S specification pin. 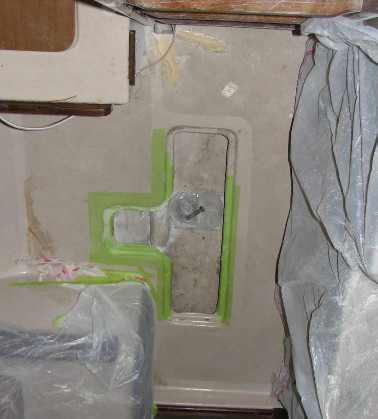 The lead keel is encapsulated in fiberglass. What we did was to drill through the hull, through fiberglass layers (easy) and the lead (tough - required special bits and a lot o'man hours). That square patch you see, above where the new CB pin hole is being drilled, is some initial grinding we did looking for the old CB pin - before we talked to the S&s people. Above left is the top of the centerboard well, exposed when the floor board is removed. You can just see the edges of the companionway ladder steps at the top of the photo. The ridge is where the board rests in the retracted position. The bolt is the original centerboard pin. Undersized to S&S specifications on the original design plan - a Yankee modification. Above right is a closer view of the centerboard well ridge top. The hole in it is were the pin was removed. 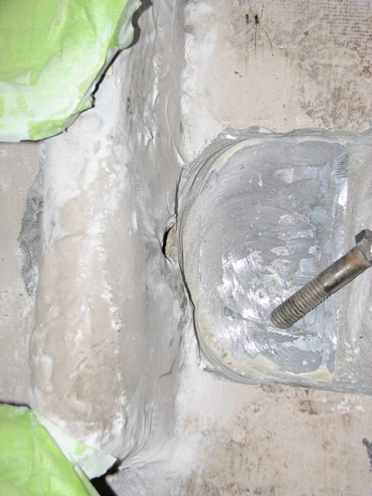 The pin bolt is seen next to the hole. This was all fiberglassed in place. We exposed it to figure out how it was constructed and why it was off from the S&S specifications. The centerboard was originally some sort of composite. I believe it was a metal core covered over with fiberglass. It was significantly lighter than the O'Day salvaged board that is all steel. The pictures, taken together, provide a thumbnail view of the endeavors and machinations including the special drilling jig that came together to get the retrofit figured, configured and achieved. The consternations, consultations and configurations converged in the end to righteously refit the centerboard. Now old Wada slices the water with the rejuvenated metal centerboard with the assurance of up to 90 degrees for the stiff breezes to point her bow higher as she climbs up into the wind toward the horizons of tomorrow. That's the short version to share in the on going saga of a great one design, a Dolphin tale of an old boat that continues to attract the praise of sailors near and far. I hope that this helps fill the void and provides some illumination to others trying to navigate their way through the challenges of keeping a classic old Dolphin boat afloat.